Rockstar earlier this month revealed that Red Dead Redemption 2 would miss its spring 2018 launch window and will instead drop on October 26. The delay no doubt dampened the spirits of gamers although it sounds like it’ll be worth the wait if leaked details from Trusted Reviews prove accurate. The publication on Tuesday shared development details they claim to have received in August 2017. The site elected not to share them at the time as they were unsubstantiated. Since then, however, much of the information in the documents have been validated in official Red Dead Redemption 2 promotional materials, giving them the confidence to go ahead and publish what was contained in last summer’s leak. Red Dead Redemption 2’s online component will feature at least three modes of play: Revive and Survive, Money Grab and Battle Royale. Revive and Survive pits two teams against each other as members race to revive fallen partners before they are eliminated while Money Grab involves teams fighting to collect money from a central location. Battle Royale sounds the most appealing, especially considering the popularity of games like PUBG and Fortnite. Like in GTA Online, players will be free to roam the game’s open world although unlike earlier efforts, RDR2’s online component will be quite complex. NPCs, for example, will decorate their storefronts and pack things away each night at the close of business. During the day, these shops will be accessible by gamers and can be used to purchase equipment or start missions. Speaking of missions, there should be no shortage of things to do in the open world. The leak mentions activities like gold-mining, fishing and herding as well as a social element that’ll include a poker minigame. Plants and herbs can be gathered for crafting purposes, we’re told, with several different varieties available. There are also dozens of different fish that can be captured using a variety of baits and tackles. To help navigating the open world, gamers will have access to a variety of vehicles including mine carts, handcarts and horse-drawn carriages with varying stats (armor, speed, etc.). It’s unclear if users will be able to customize vehicles although the report did mention horsemanship challenges you can compete in to increase your rider rank. Also of note is the fact that you can play both the main campaign and the online aspect from a first-person perspective, complete with bespoke animations to match. There’s even a wanted level a la Grand Theft Auto that increases or decreases depending on how you act in the game. 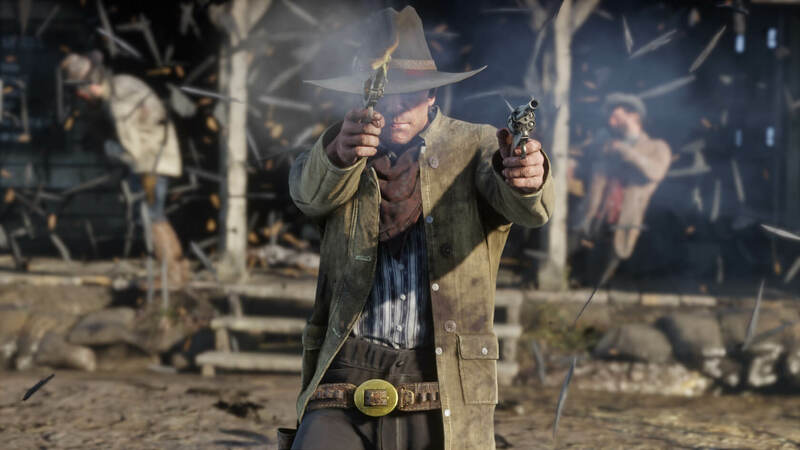 Assaulting pedestrians, for example, is considered a low-level offense while tasks like holding up a saloon and killing everyone in it will be taken more seriously. I don't know about you but it sounds like Red Dead Redemption 2 is shaping up to be one heck of an in-depth game, perhaps on the same level as GTA V. Sign me up!